This set makes the perfect addition to any baker's kitchen! 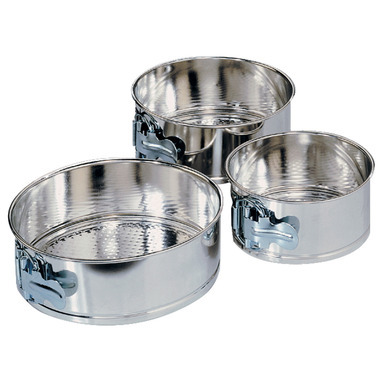 The set includes 3 mini springform pans in sizes 4 inch, 6 inch and 7 inch. With a latch release on the side you can be sure your baked cheesecake will set loose from the pan. Not the greatest quality, but price reflects that. They work well and I'm happy with them. I've worked with aluminum pans before and prefer them. These are only ok. They are on the poorer side quality wise. The clasp on my smallest one already has rust on it and I've only used it once. They don't release very easily either. They are really affordable for three pans though, so you get what you pay for.